For a variety of a reasons, I've been thinking about clever ways to try and visualize uncertainty in ancestral state estimates. Here is one attempt using an adaptation of the phytools function phenogram. 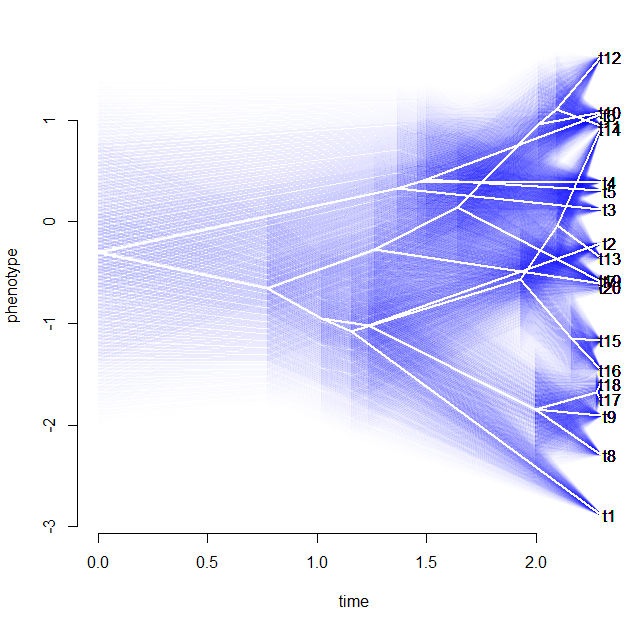 This function plots a projection of the tree into a two dimensional space defined by time since the root (on the x) and phenotype. Note that to run this I had to first add the optional argument add to phenogram, so you will need to download and load the source (phenogram.R) to get this to work. One word of caution about this visualization. Since I plot uncertainty using transparent colors, it can be difficult to impossible to extract uncertainty about any specific ancestral node from this plot. However what the plot is good at showing is the probability density of all hypothetical ancestors at any time slice through the tree. 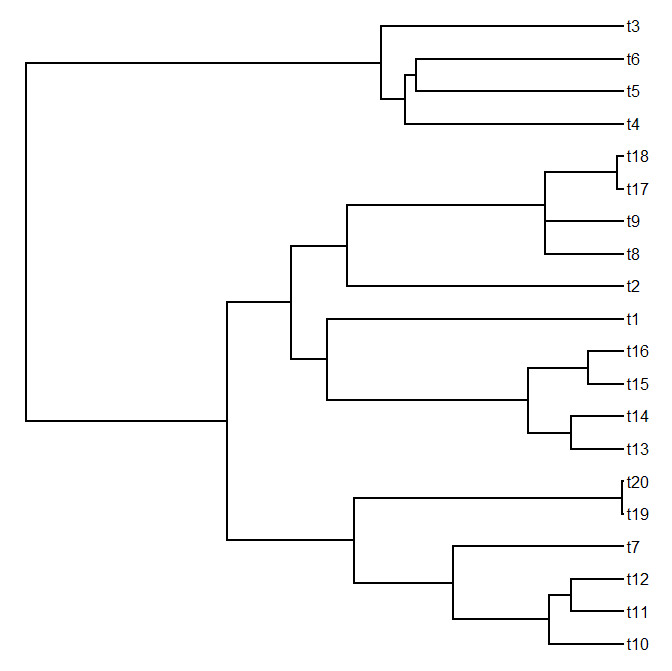 Those discontinuities in the probability density at nodes are a function of having multiple (two) lineages and then meeting and becoming one lineage, yes? Anyway, this is awesome! Made my day. So Cool! Definitely going to play with this! Thanks Liam! I'd guess it's because you don't have the latest version of 'phytools'. My recommendation is that you install the latest minor version (here) from source. Alternatively, you can install the latest CRAN version (phytools 0.2-20) and then load the source code for phenogram separately. One side-note. If you are a Mac user, for some reason the phytools 0.2-20 binary was never built by CRAN. If you can't install from source, then you can download the phytools 0.2-20 MacOS X binary from my website.